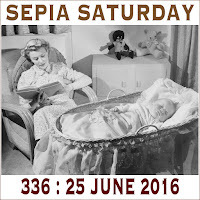 Marilyn and I take it in turns to choose the Sepia Saturday theme images - each of us doing a three month shift in turn. 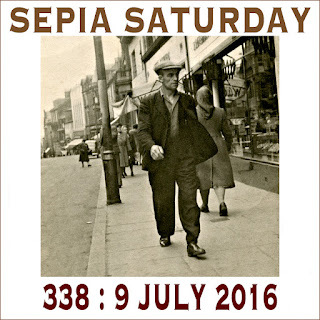 Sepia Saturday 337 marks the change of watch - and it also marks the end of our theme within an alphabet theme. 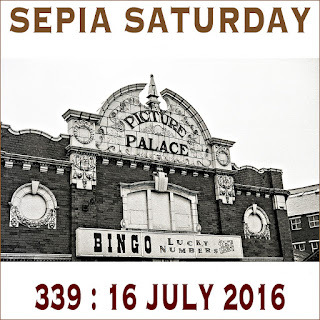 For the next three months I will be taking the theme images from the images submitted to the Sepia Saturday Flickr Group - and my thanks to those Sepians who have added images to that Group. If you haven't added any and would like to do so, there is still time - I will wait another week before deciding on the theme images for September. If you add images you will need to allow the images to be used in the public domain and also it will help if you add a few words of description or explanation. The first theme image in this set is one from my own collection and more information can be found in its Flickr Group entry. As always you can take the theme image in any direction you like - by now you all know what to do - all you need is to submit a post on or around Saturday 2 July and add a link to the list below. And here is a quick preview of the next two Sepia Saturday theme images. One further change - which is in the way of an experiment - is that rather than a separate small header, I have provided a smaller version of the main header. This makes things easier on the production side, but if it causes you any significant problems or heartache, just let me know and I will change things back again. All I want is for you all to be merry, just like Mr Ashwood and his group of players. Well, here I am, back again and just in time to see the end of our theme within a theme and Marilyn's pick of the second half on the alphabet. Our theme image is entitled "Woman Reads As Baby Sleeps" and was produced as a stock advertising image by a company called Photographic Advertising Ltd and now forms part of the collection of the National Media Museum which is available on Flickr Commons. It might seem like a "nice" bland and uncomplicated image but, believe me, there is a lot to discuss. Let's just see where Sepians go with it! Wherever you go, go there on or around Saturday 25th June 2016 and add a link to your post to the list below. This image brings to an end the first part of the year and the end of our "theme within a theme" series (yes, we've got to the end of the ALPHABET). 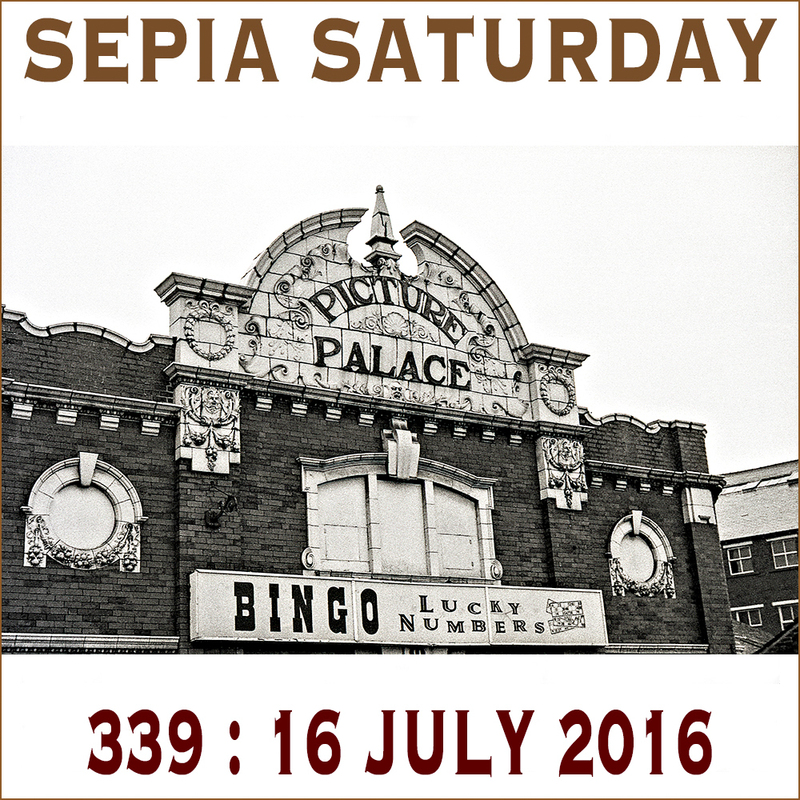 For the next three months our theme images will be based on images submitted to the Sepia Saturday Flickr Group. We are still a few images short, so there is still some time to add images to the pool from which our theme images will be chosen. Our next two theme images are the following. 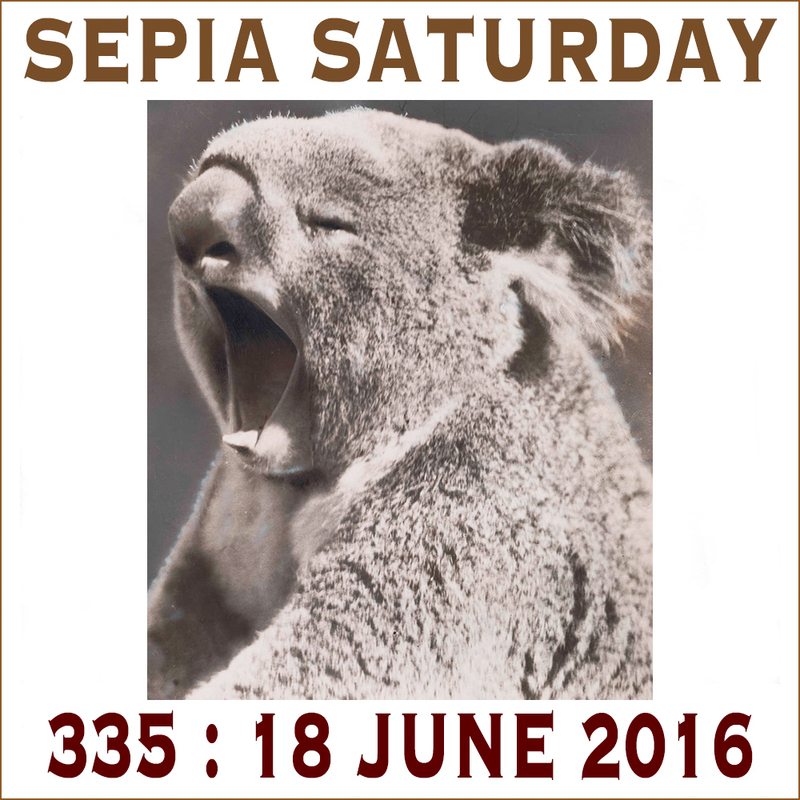 Well here we are again - yawnnnnn - it's Sepia Saturday time and when you read this I will either be on my way back from the Baltic Sea or perhaps lying at the bottom of it. It's all been very strenuous, and if truth be told I am feeling a bit tired. As I stand here, looking over the side of the boat, leaning against the rail, gazing down into the cold blue waters - yawnnnnnn - I might just doze off. But before I do so let me ask you to prepare your submissions for Sepia Saturday 335. 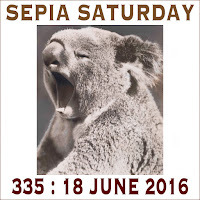 Just post your posts on or around Saturday 18 June 2016 and add a link to the list below. 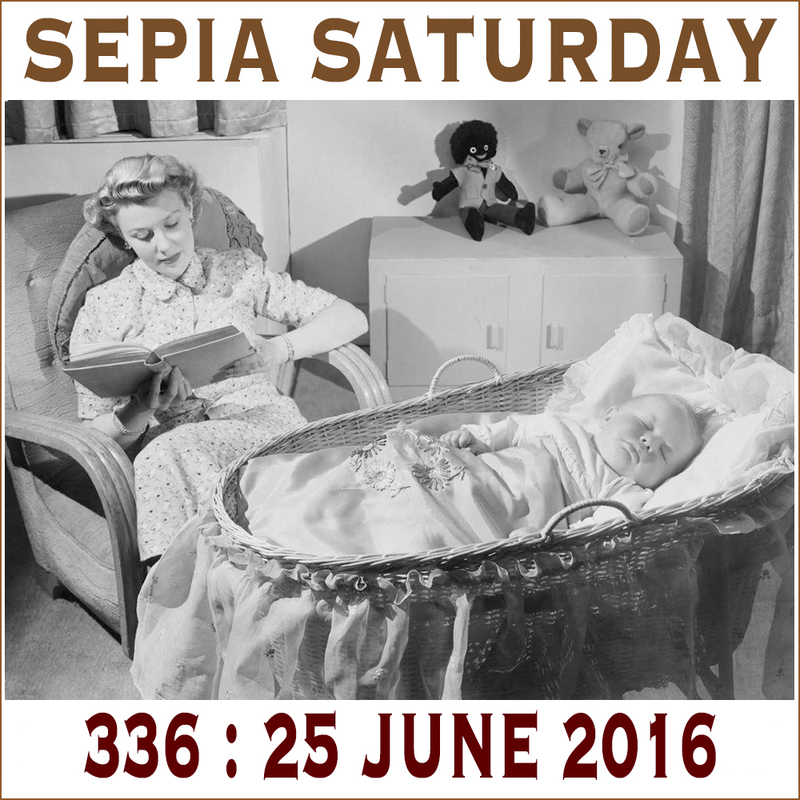 If you can stay awake long enough you might want to see what awaits you in the next couple of Sepia weeks. But that is for the future, for the moment - yawwwwn - it is time to put your contributions together for Sepia Saturday 335. As for me, I think I will just enjoy a little snooze. Yawn ---- splash! Now that is what I like to see - plenty of healthy exercise. As you read this I will be sailing on the Baltic Sea, exercising my arm by repeatedly lifting a pint glass and my hand by waving for the steward to move my sun lounger into the morning sun. 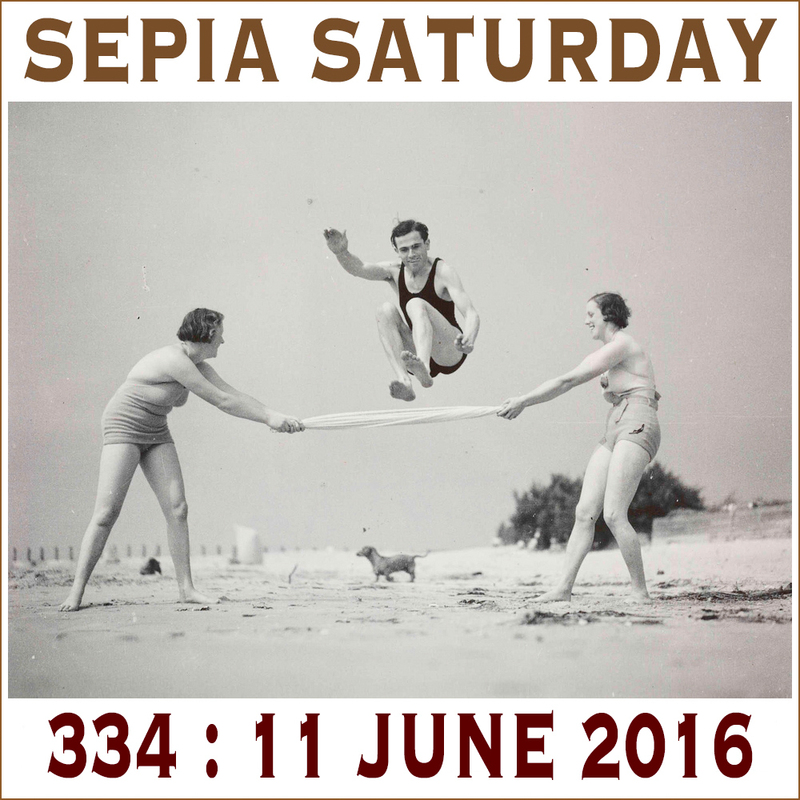 You can exercise your ingenuity by providing us with a submission for Sepia Saturday 334 where the theme image shows some energetic people jumping over a tea towel and landing on a small dog (or something like that). The photograph was taken in 1935 and is part of the National Media Museum stream on Flickr Commons. Whatever you come up with - or come down on - just post your post on or around Saturday 11th June 2016 and add a link to the list below. I will also be island hopping this week so will not be joining you. However, I sadly have to report the loss of one of members; last week Barbara, of the blog Bound For Oz passed away. 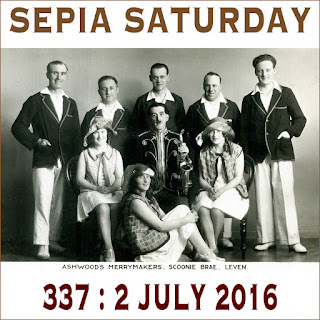 Although we are all sad, we can remember the enjoyment she gave us through her Sepia Saturday posts, which will remain as her memorial. After all the exercise of this week it looks as though things are slowing down. About time too. Waiter, another single malt please - and could you just fluff up my cushion for me.